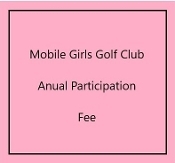 This is the anual participation fee for the Mobile Girls Golf Club. It is a one time fee. Each girl must pay this fee to participate. If a family has more than one girl, you pay just one fee for the family.